The long weekend is over and it's time for everyone to get back to work, sadly. As we know that not everyone wants the full punch of a coffee, we're highlighting a new and outstanding tea brand that we just started carrying. Legend has it tea was discovered in China and has been around for just about 4000. With humans having so many years to perfect tea, it's no wonder that there are teas out there with near flawless flavour. One of those companies that nails it to its roots every time is Higgins and Burke tea and we just so happen to have gotten it on our shelves recently! We are carrying 6 flavours all perfect in their own way. Among those flavours are three black teas: Roaring Black, Kaziranga Chai, and Bergamia Grey; Chamomint Moon and Lush Berry, which are herbal teas; and finally a green tea named Tame Dragon. So don't hesitate to stroll down to our store and try out one of these amazing choices. 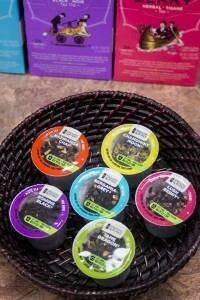 Note: we do offer trials of drinks for a dollar each k-cup. You can try one of the teas before committing to a purchase, try something else altogether, or even just stop by for a cup of coffee.